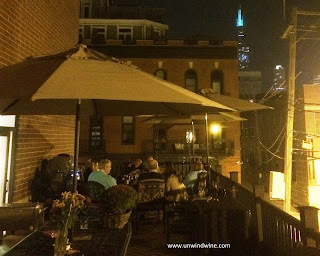 Our 'pour boys' wine group dinner was hosted by Lyle and Terry for their third wine night on the deck with cityscape views. 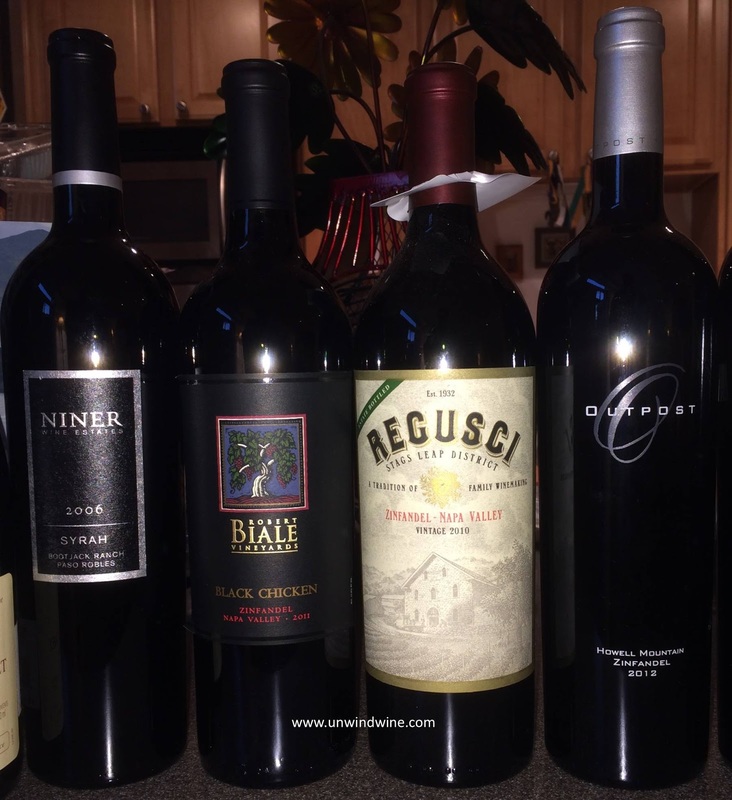 The theme for the evening was set for Syrah and Zinfandel to accompany their bar-b-cue rib dinner preparation. Their west loop residence features an extraordinary deck with cityscape views of the Willis (Sears) Tower (looming in background as shown left) and the west loop neighborhood. The spectacular mid-September evening provided a perfect clear cloudless sky and comfortable evening. This was a replay of the success of last years event of the same theme. As usual, like the previous two years, Terry and prepared an wonderful dinner ideally suited for the wine theme - bar-b-cue ribs, potatoes, green beans, salad, cornbread, corn, followed by home-made profiteroles with ice cream, chocolate and caramel sauces. Before dinner there was a selection of artisan cheeses, shrimp, grilled scallops, dips, nuts and olive trays. 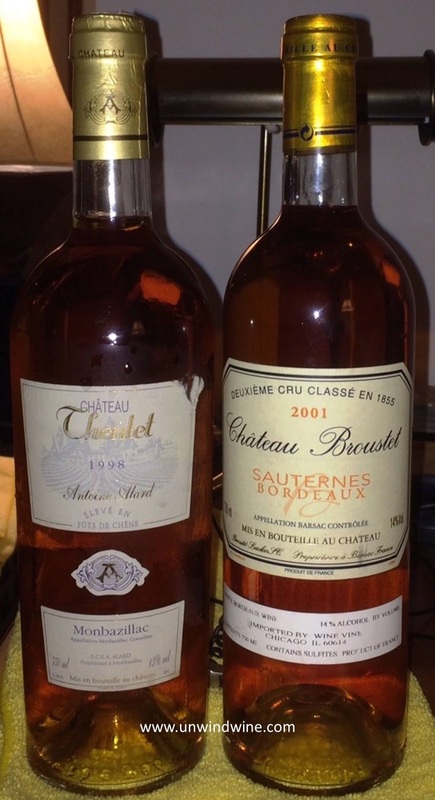 These complimented several champagne, sparkling and other white wine selections. As usual we went through our ritual of placing the flight tasting order based on the anticipated weight, sweetness and complexity of the wines. 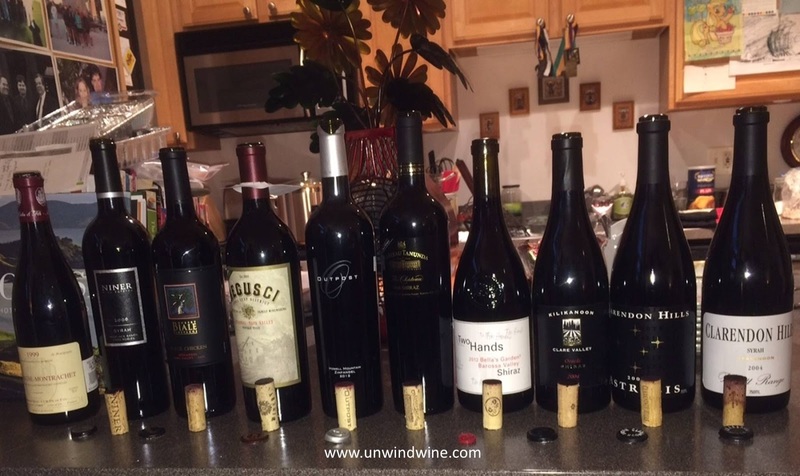 Once set, the wines are opened and tasted to calibrate their appropriate tasting order. For me, this is almost the highlight of such evenings, determining the tasting order, but also testing knowledge and perceptions of the wines and vintages and their respective tasting profiles. As usual we had the basic order generally correct, but made a few modifications based on the tasting results. Shown above is the original expected order. Surprisingly, as a result of the tasting, the Killikanoon Oracle moved to the farthest right most position - signifying it as being the biggest and most complex wine, subsequently to be tasted last, so as to overpower a 'lesser' (lighter, less complex) wine. This was remarkable considering the previous tasting experiences of the other four 'big syrahs'. Surprisingly, the Chateau Tanunda 100 year old vines Shiraz moved a couple places to the left although it compared favorably with the others. The Zinfandel flight also included the Niner Paso Robles Syrah which exhibited a profile more aligned with those wines. The Regusci and Biale compared similarly while, not surprisingly, the Outpost stood out with its Howell Mountain terroir showing bigger forward mountain fruit with that classic bramble tight firmness with a creosote anise layer. The standout of the evening for me was the Killikanoon Oracle, which I expected to show well as it is one of my favorite wines. 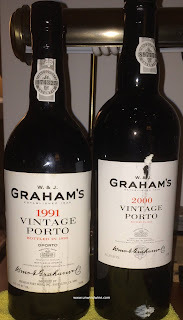 It showed dark inky purple, intense, rich, thick, full bodied, forward fruit of blueberry, ripe plum and blackberry, violet floral, and a hint of anise on the finish. 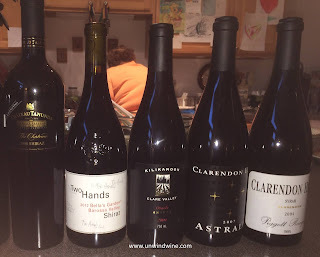 I brought the Oracle to compare in a mini-horizontal 2004 against the Clarendon Hills Piggott Range Clarendon Syrah which I expected to mirror the profile but perhaps exhibit even bigger, more forward firm concentrated fruits, which it did, but less so than the Oracle. Dan brought the ultra-premium Clarendon Hills Astralis also provided an interesting comparison between the two Clarendon Hills' labels since they no doubt contain fruit sourced from the same sites. 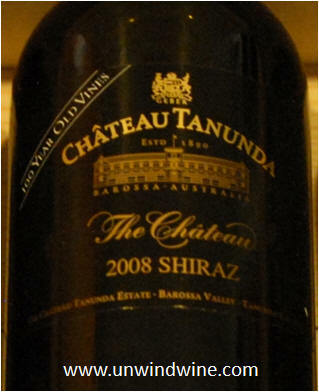 Ernie brought Chateau Tanunda from his cellar. I've written herein about us capturing nine OWC three packs of this wine - the entire allocation of this wine for midwest America during the Wine Spectator Grand Tour a few years ago. This wine continues to be a staple of our big syrah tastings that we all enjoy. We discovered this wine at the Wine Spectator Grand Tour in Chicago when it was being poured by Chateau Tanunda's Dagmar O'Neill. Only 100 cases were produced. We orchestrated a purchase of nine three packs in OWC's (shown below) which we split amongst the 'pour boys' wine team, pictured below. The Barossa is home to some of the world’s oldest Shiraz vines and the grapes for this wine come from hundred year old vines from a high altitude, one acre single vineyard in the Eden Valley. Full bodied, complex, concentrated, full lingering tannins predominate the dense, black and blue berry fruits with hints of licorice, plum, spice and spicy oak. Lyle was concerned that his beloved Grahams Vintage Port 1991 was diminished and entering the later stage of its drinking window. He acquired a case of this wine and has been enjoying it over the decades but was concerned about its recent change in its profile. 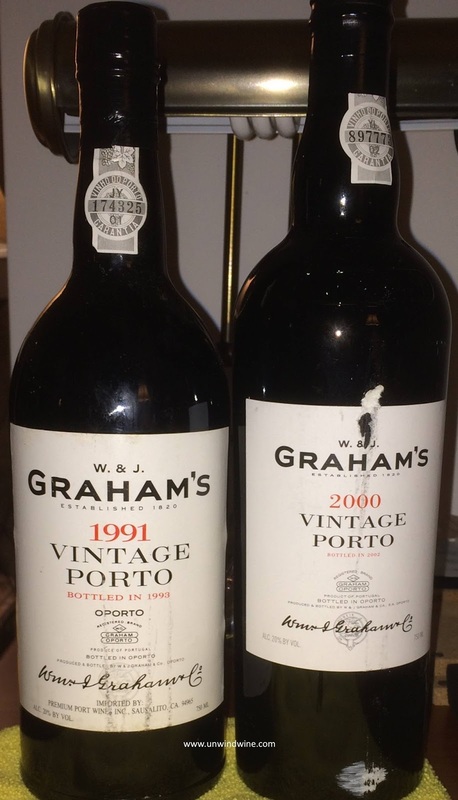 The consensus of the group was that is was fine, aging normally and gracefully, simply showing it natural aging maturation. We're all getting older!